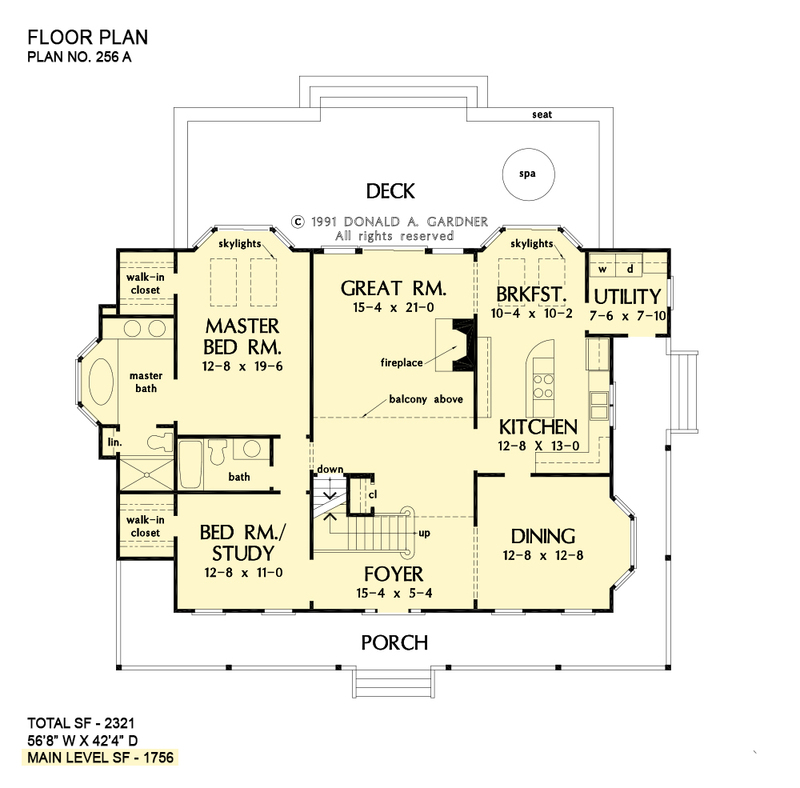 Casually elegant for today's lifestyle, this stylish farmhouse floor plan with wrap-around porch and large deck features gracious windows front and rear for optimum use of natural light. The second-level balcony gives the great room a contemporary air, as does the cathedral ceiling and clerestory dormer with palladian window. Bay windows expand living space in the dining room, breakfast area, and master bedroom. Located on the first floor of this home plan, the master suite has skylights, access to the deck, and a well-appointed bath with garden tub, separate shower, and linen closet. The front bedroom does double duty as a study. 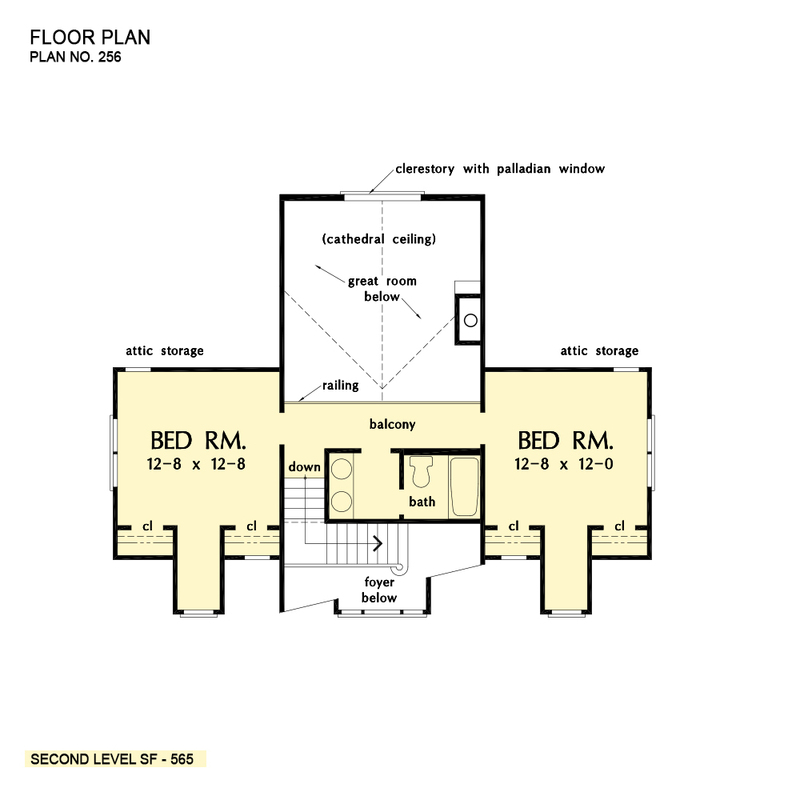 1st Floor: 1756 Sq. Ft.
House Dimensions: 56' 8" x 42' 4"
Master Bedroom: 12' 8" x 19' 6"
Foyer (Vaulted): 15' 4" x 5' 4" x 19' 0"
Dining Room : 12' 8" x 12' 8" x 8' 0"
Breakfast Room : 10' 4" x 10' 2" x 8' 0"
Utility Room : 7' 6" x 7' 10" x 8' 0"
Master Bedroom : 12' 8" x 19' 6" x 8' 0"
Bedroom / Study : 12' 8" x 11' 0" x 8' 0"
Bedroom #2 : 12' 8" x 12' 8" x 8' 0"
Porch - Front : 42' 0" x 5' 6" x 0' 0"
Porch - Left : 5' 6" x 10' 3" x 0' 0"
Porch - Right : 5' 6" x 26' 2" x 0' 0"
Deck / Patio : 42' 0" x 13' 6" x 0' 0"
Storage (1st Fl.) (Sloped): 3' 2" x 7' 0" x 0' 0"